PIR motion sensors can be quite expensive, and require additional electronic circuitry if they are to be put to use in anything other than typical domestic security systems. 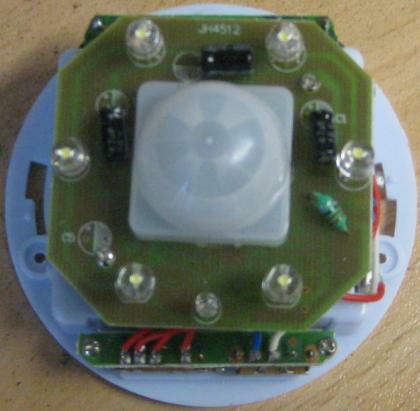 Options include this KC7783R PIR module designed to be used with microcontrollers or other additional electronics, or domestic alarm system PIR units such as this PIR sensor from security system brand Honeywell. We are frequently asked to put together a range of 12 Volt powered motion detection systems ranging from unwanted neighbourhood pet repellers to full on motion activated CCTV. To this end we sell this PIR Relay Timer which can be connected with most domestic PIR sensors to switch on lighting, sirens, cameras, or any other outputs for a user programmed length of time when motion has been detected. We recently came across the PIR product pictured above and were startled at the price – less than £3 including delivery from Hong Kong to the UK! It is a 4 AAA battery-powered motion sensing automatic light fitted with a fully functional PIR sensor, a light detector, six high powered white LEDs. Click here to buy this PIR Motion Dectector Lamp and similar products. This device offers a selection of user settings – the ambient light level at which the LEDs will be turned on when motion is detected (since you only want them to come on when it is dark to save power), the brightness level of the LEDs from very dim to very bright, and best of all a selector switch to choose for how long the lights are to be turned on when motion has been detected: 20 seconds, 60 seconds, 90 seconds, or on continuously. It even has strong magnets fitted in the back of the unit so that the lamp can be stuck to an iron-based metallic surface. We immediately ordered a few units and found them to be pretty well made – actually extremely well made considering that the cost of manufacture must be well less than £1. They worked exactly as described, were reliable and consistent, and carried on working for months without failing. Our main interest however was in finding out whether it would be possible to cannibalise one of these units to put it to alternative uses – the aim being simply to switch a relay when motion is detected since if a relay can be switched when motion is detected absolutely anything else can be controlled. Checking the specs we found that the standby current of this device is just 0.35mA, but it draws up to 65mA when the LEDs are on at their maximum brightness. Therefore this is a very efficient product while it is waiting to react to motion, but it also has the capability to provide at least 65mA of current @ 3 Volts* which we can use to energise a relay instead of lighting up the LEDs. * While this unit takes 4 AAA cells, the battery bay is configured so that two sets of 2 AAA cells connected in series are connected in parallel. This gives 1.5 + 1.5 = 3V, but double the charge capacity that there would be with just 2 AAA cells. 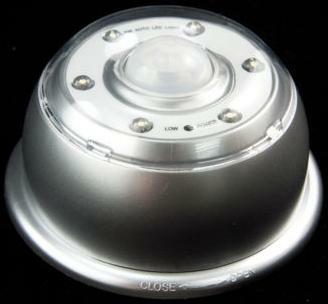 The back of the PIR lamp is designed to be twisted off to give access to the user-setting functions as shown above. The front domed part is held in place by the three small screws located next to the adjustment wheels and switches. Remove these screws and the internal electronics are exposed. Having taken the unit completely apart and examined it minutely, we found that there are many ways to use it to switch a relay. The easiest by far turned out to be not taking everything completely apart, instead simply cutting off one of the six LEDs, soldering leads onto the terminals to which the LED was connected, and connecting those across the coil of a low power consumption 3V relay. 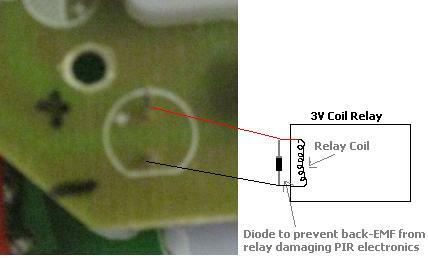 We set the LED brightness adjustment wheel to maximum to get the highest voltage possible across the relay coil. When motion was detected, the relay closed, and then after the 20 seconds delay we had set had elapsed, the relay opened again. Perfect. 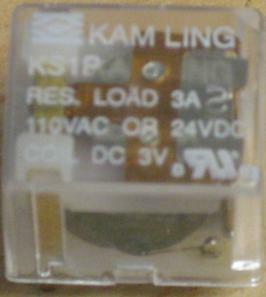 The only 3V relay we had to hand had a 150mA coil (pictured above). Using this relay pulled the voltage measured across the LED terminals down from 3V to 2.17V which resulted in the LEDs giving a tiny flash when motion was first detected before they turned off completely as the lower voltage was insufficient to light them up. 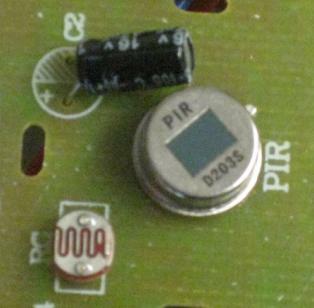 We were unable to ascertain whether our relay was overloading the PIR lamp circuitry, but we left it on continuously for a week and nothing failed or got noticeably warm so it seemed to be fine. Using a more efficient relay (for example many 3V relays are available with coil currents of <50mA) would have resulted in the voltage not being pulled down by much at all, and the remaining LEDs on the lamp coming on when motion is detected. However, for most applications the LEDs are not really required anyway, so we would recommend cutting all but one of them off to reduce battery power consumption. Keeping one LED fitted is useful for troubleshooting to give visual confirmation that motion is being detected properly. A 3V relay with a low coil current will not usually be able to switch much current, but it can be used to switch a secondary relay sized according to your project’s requirements – e.g. an automotive relay will be able to switch up to 30-40 Amps at low voltages, or smaller PCB relays can be used to switch mains and low voltages of up to 16 Amps. The PIR sensor (pictured above) fitted to these automatic lights is a D203S (a device which we could only find at £2 or more each plus postage here in the UK!). 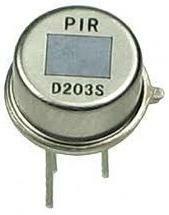 The user manual for this PIR sensor is available for download here: D203S PIR User Manual. It is fitted behind a Fresnel lens which gives it a 90 degree detection angle and a range of up to 3 metres. The light detector (which is located behind the Fresnel lens) is exactly the same as the mini LDRs we sell. The device weighs 88g (not including batteries). We would be very interested to hear how you get on if you attempt to modify one of these PIR sensors, and any other modifications you come up with. Please email neil@reuk.co.uk.